The Scotsman Wed 12 Feb 1845 MELANCHOLY ACCIDENT-EIGHT BOYS DROWNED AT SHOTTS-On Tuesday afternoon the 4th current, eight fine boys, belonging to the <?xml:namespace prefix = st1 ns = "urn:schemas-microsoft-com:office:smarttags" />village of Sallysburgh, Shotts, lost their lives in a reservoir (generally called Bogfoot Loch”) in the immediate neighbourhood, while engaged in the amusement of sliding. The accident took place unseen by any one; and the fears of their village were only roused by the boys not making their appearance as usual in the evening . The night was fearfully dark, and the fatal spot of which the boys had sunk was unknown. What a night of anxiety and sorrow the poor parents must have must have passed! As soon as the morning dawned , an immense crowd of people assembled, and having procured planks and ladders and ropes, for the purpose of reaching from the bank to the place where they must have sunk-a task of considerable difficulty and danger, on account of the frailty of the ice, and the depth of the water-they succeded at last in bringing out the bodies of the whole eight youthful sufferers. The scene was truly affecting when body after body was brought to the bank; and few that witnessed it could refrain form tears. And when parents who had lost one child were so agonized with sorrow, what must have been the feelings of those of them from whose domestic circles two children had been taken away at once.-Abridged from the Glasgow Citizen. Everything that humanity can suggest has been done to soothe the sorrowing parents and friends. 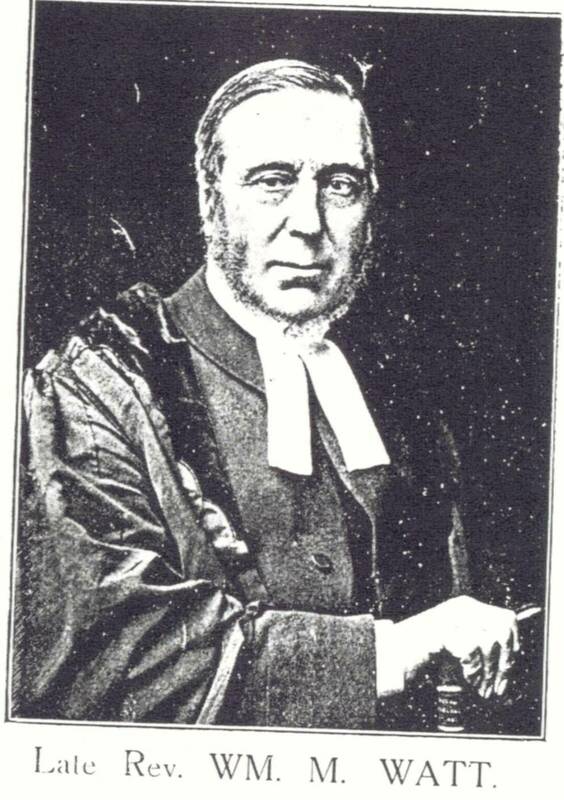 The clergymen of the parish of Shotts, the Rev. Messrs. Watt and Hill, have been most assiduous in their attentions: while the country people around have evinced, by their inquiry and attention, that they, too, deeply sympathize in the melancholy cause of so much general sorrow. The Reverand Watt (left) one of the ministers who conducted the funerals of the unfortunate boys. LINES ON THE DEATH OF EIGHT BOYS WHO WERE DROWNED ON 4TH FEBRUARY, 1845 IN DUNTILLAND LOCH IN THE PARISH OF SHOTTS. Probably written by William McHutchison. shortly after the tragedy. (Salsburgh Heritage Group).